Ron Martin: community member, business owner, CASA Advocate. Upon learning they could not have biological children of their own, Postal Graphics Owner Ron Martin and his wife Jill went through the foster care system to adopt their daughter Mari.”I wanted to volunteer with an organization that helped kids and made a difference.” Despite the Martin family’s positive experience (five years and four successfully closed cases later), there are still children in the community in need. Martin shares, “There are more kids out there than advocates. I encourage people out there if they love kids (to participate). It does not require a lot of time you know, an hour or two a week. Everyone has an hour or two a week they can spare.” Read more here. Pictured: Hon. 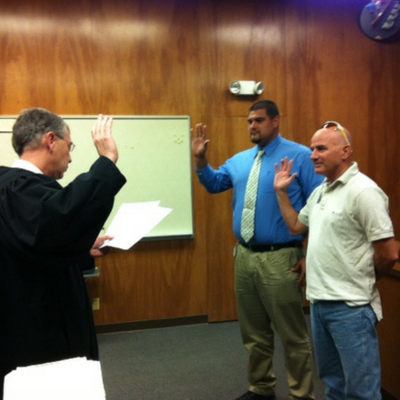 Judge Sanders swearing in advocates Roy Sims & Ron Martin. To start off with, I think my CASA worker is a good role model to me. She is a super caring, nice, thoughtful person and really fun to hang out with and I think she really cares about my life. To be more clear: my future and my education. By this I mean I have another person to look up to and follow the good choices she has made. On the other hand, I think the best part of having a CASA worker is having another person to support me in my life and guide me through life’s challenges. Pictured: CASA Youth with her advocate, Vanessa Martinez, holding the youth’s published winning art entry, “My Dream House”. Before my CASA, my life was a bridge ready to break down. Coming from a home with strictly religious parents, where there’s nothing but verbal abuse, and sometimes physical abuse… having to fight in school, and home. Then I met my CASA and as I spent time with her, I started learning new strategies on how to communicate with others with respect, how to have fun and interact with people, and also how to stick up for myself when things went wrong. CASA made a really big change in my life. 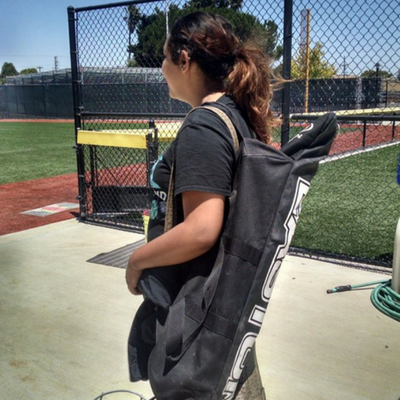 Pictured: CASA Youth on her first day of softball summer camp. Her CASA was able to locate, enroll, and assist with transportation to ensure she was able to participate in one of her passions.